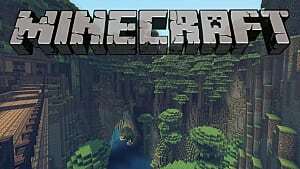 Like any game, playing Minecraft for the first time can be an enjoyable experience, albeit a daunting one; however, the true challenge lies with building a solid foundation for your adventure. We've collected some of the strongest spawn point seeds for January 2018, from generated villages to strategic settings. Whether you brave the wilderness alone or tag along with your friends, possibility in Minecraft awaits. Spawn in the plains biome with immediate access to sheep. Without shears handy, be sure to down a few before heading north toward the forest village (coordinates: 65, 135). While there's no forge or chest present, the crafting table will provide a suitable start to your adventure. When you're ready, head west toward the plains village (coordinates: -417, 255) to loot six obsidians, two apples, and a pair of iron leggings and iron boots. Spawn in the plains biome adjacent to the desert and savanna biomes. Head west toward the nearest village (coordinates: 116, 334) to take advantage of the crafting table, as well as the nearby sheep, cows, and pigs. Note: The gold ingots and rotten flesh can be used to trade with villagers in exchange for emerald. Spawn adjacent to a plains village (coordinates: -170, 218) that's swarming with zombie villagers. Before heading toward the forge to loot the chest, try luring them into the sunlight to enter safely. The reward? Three breads, an iron pickaxe, a saddle, and a pair of iron boots and iron leggings. If you lost health during the skirmish, take advantage of the pigs and chickens wandering the village pathways. When you're ready, put the saddle to use by mounting one of the nearby horses to begin exploring. Note: A Witch's Hut can be found in the swampland biome by heading west (coordinates: -412, 52). There are no stairs leading to the hut, so if the Witch manages to fall into the water, it will be unable to reenter. Looking for a diamond in the rough? Spawn adjacent to a taiga village located between the plains and swampland biomes, where you'll be able to loot a saddle, two iron ingots, iron leggings, and three diamonds. Use the iron to craft a pair of shears to acquire wool from the nearby sheep. You can also down the pigs wandering the village pathways for food. When you're ready, ride north through the plains to locate a village along the coast (coordinates: 671, -282) to score six obsidians, three breads, two apples, and an iron ingot. 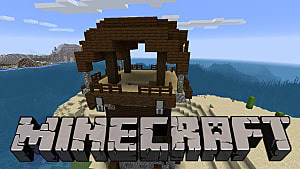 Enter this survival island seed with limited resources and no food. After you've set up an initial camp, head south when you're feeling a bit hungry to encounter an island with two pigs. If that doesn't satisfy your palate, head farther south to reach the mainland, where you'll discover sheep and a much stronger supply of wood, stone, and food. Be sure to check out the village in the plains biome (coordinates: -408, 888), southwest from the spawn point, before heading into the water temple (coordinates: 215, 247). 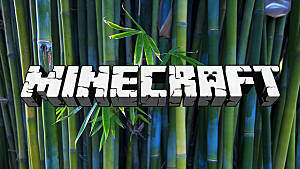 From the spawn point, travel north to encounter a savanna village (coordinates: 230, 15) located between several biomes. While the village could serve as a strong base of operations as you explore the area, be sure to gather some wool from the sheep wandering the village pathways to craft a bed. Don't forget to arm yourself! The village chest contains three breads, five gold ingots, iron boots, iron leggings, and gold horse armor. In contrast to the previous survival island seed, entering this biome gives immediate access to a large number of sheep and cows, but an extremely limited supply of wood. 1 Notch Apple - a rare and powerful food item! Note: If you carefully dig below the TNT trap hiding under the pressure plate, you'll uncover sizable deposits of coal and iron. From the spawn point, travel east to locate a village abutting a swampland biome (coordinates: 285, 238). 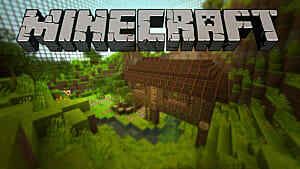 This seed offers a strong start, as the village is surrounded by a large number of pigs. You can also loot the forge chest to acquire four oak saplings, three breads, an apple, two iron ingots, an iron helmet, and an iron chestplate. While there are no sheep in the village's vicinity, you can scare enemy mobs away by using the nearby pumpkins to craft jack-o'-lanterns. Go north from the temple and take up residence in the neighboring plains village (coordinates: 135, 30); however, players should not lower their guard, as the village is swarming with zombie villagers. If you're quick enough, you can loot the forge chest to acquire an iron sword, iron helmet, and an iron chestplate to defend yourself. When the area is secure, don't forget to loot the remaining three apples, two gold ingots, and nine oak saplings. You can shear the nearby sheep to craft a bed before setting out on your next adventure. 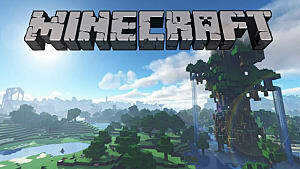 From the spawn point, travel northwest through the densely forested taiga biome to reach the village (coordinates: 90, -400) located along the coast. Plunder the forge chest to acquire three diamonds, four obsidians, five oak saplings, and an iron sword. Take advantage of the sheep wandering the village to craft a bed. Note: Consider going for the chests during the day, as they are all located on -- or close to -- the surface. You can test your strength by taking on the monster spawner deeper inside (coordinates: 267, -276). Spawn in the plains biome and head north to locate a village abutting the swampland (coordinates: 0, 192). While there's no chest to loot, you can stock up on food and use the nearby sheep to craft a bed before starting off on the real adventure. The gorge (located at coordinates: 13, 277) is indeed unassuming at first sight; however, with some proper mining, you'll uncover a massive tunnel network containing large amounts of coal and iron, as well as deposits of redstone, lapis lazuli, gold, diamond, and emerald. If you need to craft torches, spare no expense. 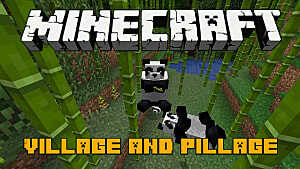 Spawn in the taiga biome and travel west to locate the plains village (coordinates: -175, 200). 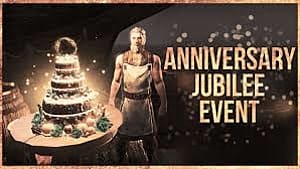 Be sure to loot the forge chest containing five iron ingots, gold horse armor, three oak saplings, six breads, and an iron helmet. When you're ready, head east toward the extreme hills, where you'll be able to fortify your position in this massive stone formation positioned conveniently on the water. Note: Should you choose to set up camp here, use the stone formations jutting from the water as light towers to find your way back home. 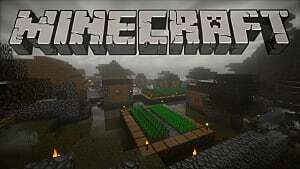 Spawn between two villages in the plains biome and head north to locate a village (coordinates: -305, -392) with a chest containing an iron helmet, six apples, and seven obsidians. Want to finish your Nether portal? 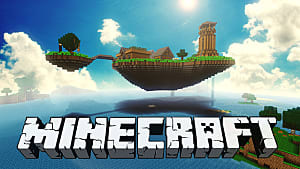 Go farther north into the desert to locate another village (located at coordinates: -239, -972), which holds three breads, five iron ingots, a saddle, a diamond, diamond horse armor, and an iron helmet. When you're ready, consider heading back south toward the Savanna M biome, where you can build a hidden camp -- or pirate fortress -- in this chaotic rock formation. From the spawn point, travel south toward the desert village (coordinates: 368, 130) to quickly gather an iron sword, three apples, five breads, and four diamond. When you're sufficiently supplied, return northwest to the savanna village (coordinates: -239, -972), located at the base of this massive rock formation in the Savanna Plateau M biome, where you can take advantage of the crafting table to stock up on any relevant starting materials. Consider ascending the plateau's waterfall. High off the ground, you'll be able to safely build your starting stronghold. 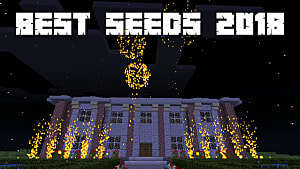 Once you've had a chance to check out all these Minecraft spawn point seeds, let us know in the comments below which one is your favorite.